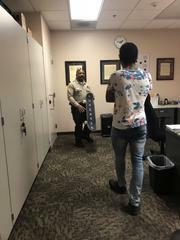 Lancaster Sheriff's Station Lieutenant Jones helps young adult with new skateboard, gets skateboard named after him! On Tuesday, Lancaster Sheriff's Station came in contact with 19 year old Tyler. 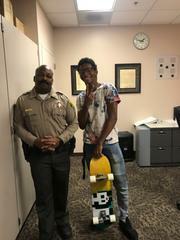 Tyler's skateboard had been destroyed and he mentioned to Lieutenant Jones that was his only means of transportation. Tyler is currently working 3 jobs and was not in a position to afford another skateboard. 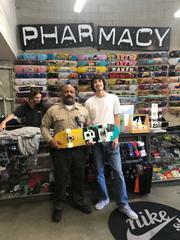 This morning, Lieutenant Jones went to Pharmacy Boardshop - Lancaster and out of his own pocket, purchased Tyler a brand new skateboard, the same Enjoy deck and bigger wheels he had on his old board. You can imagine Tyler's face when we surprised his later in the afternoon with a brand new board. 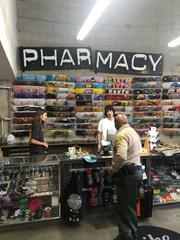 He was so grateful, he named his new board "LT" and put a Los Angeles County Sheriff's Department star sticker on it. Whether it's arresting a bad guy or helping out a young adult, our deputies are here to make every city the best it can be. A big thank you to Austin and his staff at Pharmacy for helping us out with a discount! We hope Lieutenant Jones knows how special his act of kindness was! My hero wears a badge.